They say imitation is the sincerest form of flattery and nothing could be truer in the food realm. I’m constantly trying to imitate the creaminess of cheese, the al dente bite of a perfectly cooked noodle, or the savory unctuousness of a great cut of beef. I usually fail and the people I’m trying to fool feel gipped. Let’s face it, zoodles (or zucchini noodles for those not hip to a spiralizer) don’t taste like spaghetti. Pureed cashews will never fulfill my deep yearning for cheese. “Yeah,” I said defensively! Zucchini noodles are my new spaghetti, and truth be told, I’ve gotten used to them. Wrapped in the luscious, nutritional yeast packed, “Alfredo” sauce, I feel like I’m getting a real treat. Isn’t it amazing how humans can adapt? As I drove home that night, fuming only slightly, I realized that my mom was right. Zucchini noodles are too moist, soggy almost, and no amount of salty, creamy sauce is going to magically turn them into tender pasta noodles. I’d like to say I gave up the food imitation game right then and there, but I didn’t. I tried again and again, trying increasingly time-consuming and impractical techniques to turn vegetables into pasta. You have no idea how maddening it is to try and ring the moisture out of small spirals of vegetables with paper towels. Having counted out both yellow squash and zucchini as suitable pasta impersonators, I moved on to the spaghetti squash (the name sounded promising, at least). I simply cut the squash in half, sprinkled with olive oil, salt, and pepper and roasted for an hour. When the flesh was tender I ran a fork through it and was amazed that it transformed into what resembled spaghetti. Topped with a rich Italian sausage and wine sauce, I declared triumph over the sticky spaghetti situation. 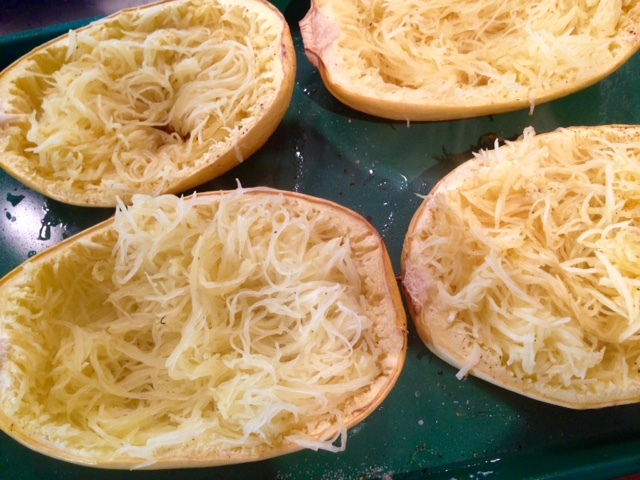 Cut the spaghetti squash in half, length wise. Brush the cut side lightly with olive oil and sprinkle with 1 teaspoon salt and ½ teaspoon pepper. Bake for 1 hour. While the squash is baking, begin making the sauce by heating a large saucepan at medium heat. Add two tablespoons of olive oil and the chopped onion. Sauté until translucent, about 5 minutes, and then add the sausage (after removing its casing). Crumble the sausage in the pan with the back of a wooden spoon as it cooks. Once slightly brown, about 5-7 minutes, add the garlic and stir until fragrant, about 30 seconds. Next pour the wine in the pan and scape the bottom to loosen the brown bits of sausage and onion. Let cook for about a minute and then add the jar of spaghetti sauce. Let simmer on medium-low for 15-20 minutes. 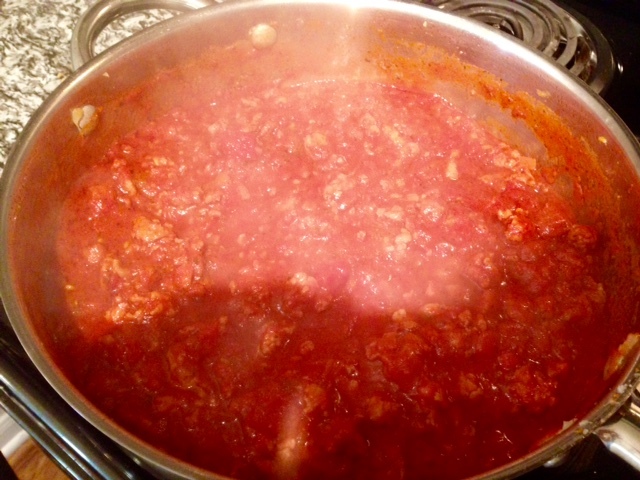 The sauce will reduce and thicken slightly as it cooks. Right before serving, add the chopped basil. Remove the squash from the oven and set aside to cool for 10 minutes. When the squash is cool enough to handle, take a fork and scrape the flesh, running your fork length-wise. 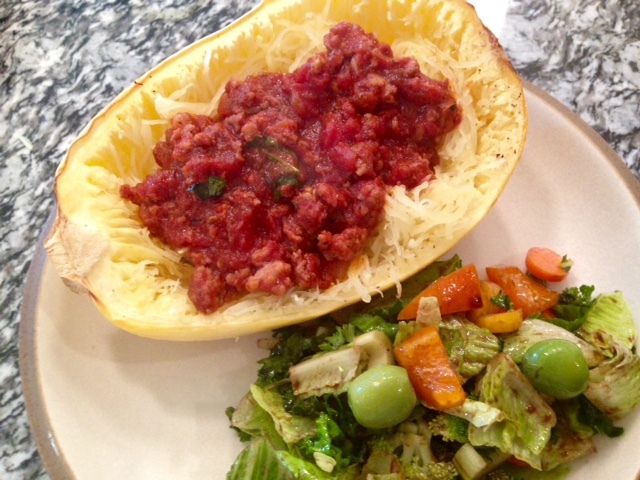 Top the squash halves with several large spoonfuls of the meaty spaghetti sauce and serve.